By Payton Titus, Swimming World College Intern. 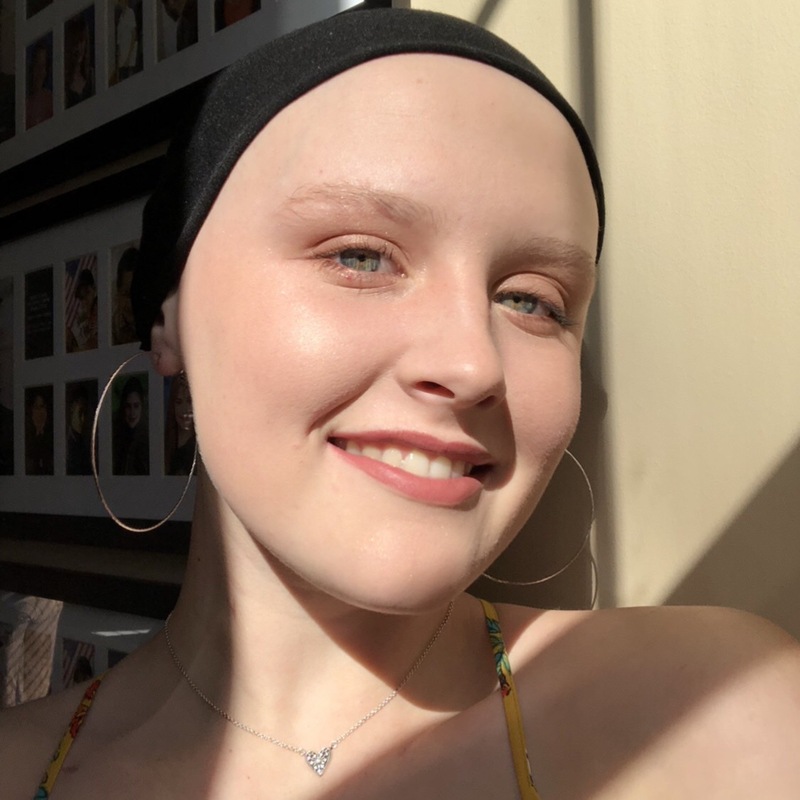 No teenager has cancer treatment on her to-do list. There’s enough on her mind: college entrance exams, swim practice and social outings. However, one swollen lymph node can be the harbinger of a difficult journey of stepping back from swimming to endure countless cancer treatments, hair loss and healing. But let’s start this story from the beginning. It was Nov. 19, 2017. My alarm clock went off at 6:00 am: time for warm-ups. The final day of this marathon meet had finally arrived. Fresh off of high school season with a sprained rib, the last place I wanted to be was the Turkey Meet in Orlando. To make matters worse, my shoulder and left collar bone had started hurting that weekend, and I still had a lot more butterfly left to swim. I talked it over with my mom and we both agreed that I was due for an appointment with the chiropractor anyway, so once we got home I could get adjusted and go on my merry way. Fast-forward a few days: I’m at the chiropractor’s office. I tell him about my shoulder and collar bone pain, showing him how swollen it had gotten in the last week or so. As he begins to examine the area, his diurnally cheerful face turned pallid. Immediately, he told me to call my mom and set up an appointment with my pediatrician. This wasn’t a bone or muscular injury; it was a lymph node. I slowly made my way towards the room where I had been receiving shock and ice therapy for my back and called my mom. I told her what Dr. Chad had told me and tried to express the urgency that he had. I didn’t see what the big deal was; swollen lymph nodes just mean that you’re getting a cold. After I hung up, I googled “swollen lymph nodes” just to be sure. Just as I suspected, the list of possible diagnoses included the following: cold, flu, infections or cancer. That last one threw me for a loop. Cancer? No way. I’m a healthy 16-year-old girl who swims six days a week for two and a half hours at a time, eats well and doesn’t stay out past 10 o’clock. For weeks, I was in denial. I visited my pediatrician, who sent me to an ENT (ear, nose and throat doctor). The ENT ordered blood work and put me on an antibiotic. “The swelling should go down in three days or so”, he said. It didn’t. After three days, the swelling got progressively worse. Now, this swollen lymph node had become so enlarged that I started to feel a tingling sensation in my arm because it had begun pressing on my nerves. After three days, I started to notice the same area on my right side begin to swell up; something wasn’t right. The ENT said that my bloodwork had come back fine, but the continuous swelling concerned him. He referred me to Dr. Pulous of Nemours Pediatric Surgery. Surgery? I had never even had my wisdom teeth taken out, let alone undergone a biopsy. Twenty minutes had gone by with Dr. Pulous until he decided that a biopsy was what needed to be done. “Because of the size and the position of this particular swollen node, I recommend that we do a biopsy. We’re better off safe than sorry,” he said. We scheduled the extraction for the following day. I remember walking into the preparation room and being asked to step on a scale beforehand. I hadn’t been to practice in weeks, so when I saw that I lost seven pounds, part of me knew what was coming next. While waiting for me to wake up, Dr. Pulous went into the lobby to talk to my parents. He told them that they would call us the following Monday if it was good news and sooner if the results were what we were all hoping for. Home we went, anxiously awaiting. It was Dec. 8, 2017. My mom’s phone started ringing. She answered, recognizing the voice on the other end of the line. Calmly, she grabbed a notecard and a pen and started to write something down. She then hung up, took my hand and led me to my dad’s home office. My dad grabbed both of us into a tight, comforting embrace. “We’re going to get through this. A positive attitude is going to make the difference. You just have to stay positive,” he said. That was the third time I had ever seen my dad cry: once at his grandfather’s funeral, on the night that leukemia took his mother, and on December 8, 2017. Three weeks later – the day after Christmas – I started treatment. It consisted of four 21-day cycles where I received five chemotherapy drugs on day one, three on day two, two on day three, and two on day eight. For the last week of every cycle, my mom had to give me Neupogen shots to keep my white blood cell count up. Every weekend from then until August 2018, I had to take an antibiotic twice a day on the weekend to rebuild my immune system. For those four months, I took a hiatus from swimming. Although I missed my swim team friends, I went to local meets as often as I could and met new friends on the oncology floor of Wolfson’s Children’s Hospital. My high school teammates and head coach surprised me a few times by bringing brownies, gift baskets, and brief escapes through pleasant conversations up to my room and into my home. Just after my 17th birthday, I was declared officially in remission. My hair has since started to grow back, my body has become stronger, and my heart is now fuller than ever before. Although I have yet to return to competitive swimming, my journey through diagnosis, treatment, and remission solidified life-long friendships between myself and the teammates who stood by me. We may not all be swimmers forever, but we will be indebted to the sport for our entire lives because of the relationships made and lessons learned. Swimming taught me to put my head down and finish into the wall. That lesson is the reason why I stand here today, telling you this story and calling myself a survivor.